“There are several battles that need to be won and several frontiers that need to be expanded in order to improve the quality of the built environment and consequently people’s quality of life……The 15th International Architecture Exhibition will be about focusing and learning from architectures that through intelligence, intuition or both of them at the same time, are able to escape the status quo. We would like to present cases that, despite the difficulties, instead of resignation or bitterness, propose and do something. We would like to show that in the permanent debate about the quality of the built environment, there is not only need but also room for action”. The question is will we see more landscape architecture at the 2016 Venice Biennale? I am hoping that Aravena looks to landscape architects to provide some voices on the “debate about the quality of the built environment”. After attending the 2014 Biennale – Fundamentals – that was beautifully curated by Rem Koolhaas, however there were few pavilions or exhibits focusing on landscape. I understand that the 2016 Venice Biennale and all biennales are architecture exhibitions but often landscape architecture and landscape architects are under represented and whilst walking around the 2014 Biennale I felt that one of the most important fundamentals – the landscape – which is the site and context within in architecture is placed was not acknowledged. I hope that Alejandro Aravena heeds my call for more representation of landscape architecture at the 2016 Venice Biennale and allows landscape architects access to curate part or whole exhibitions to be able to participate in the “permanent debate about the quality of the built environment”. 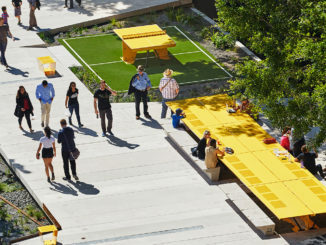 Landscape Architecture is a key part of the design conversation about the quality of the built environment and how we can improve urban and rural life through positive design outcomes. I look forward to visiting the 15th International Architecture Exhibition that will take place from 28 May to 27 November 2016.